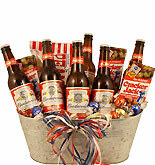 It starts with 12 bottles of beer in a basket, but there's no telling where the night might lead. 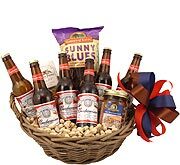 This sturdy basket contains a wide selection of salty snacks and enough beer to share with friends. It also contains enough beer to keep one person drinking for a night or two, and your loved one will know that you're there in spirit. Whether they take a beer out and pass it around or they keep the Bud a secret, you'll know that you did your part to show up for someone special. Being a retired master carpenter, already owning every possible tool with truly no other hobby than woodworking, I found this basket. Also we are a 7 hr ride away from each other. "Bud" is the ONLY beer he likes and will even drink. He was amazed at how well it was packed to keep the bottles safe & HE LOVED IT!!!!! He couldn't image where I had found/gotten it. Thank you, Beergifts.com! Sent as a gift-long time friend. Loved it. 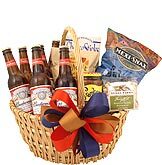 Did not know you could send beer baskets with other goodies. Thanks for making someones day special! this gift was well-received and loved. everybody in the room wanted the basket.